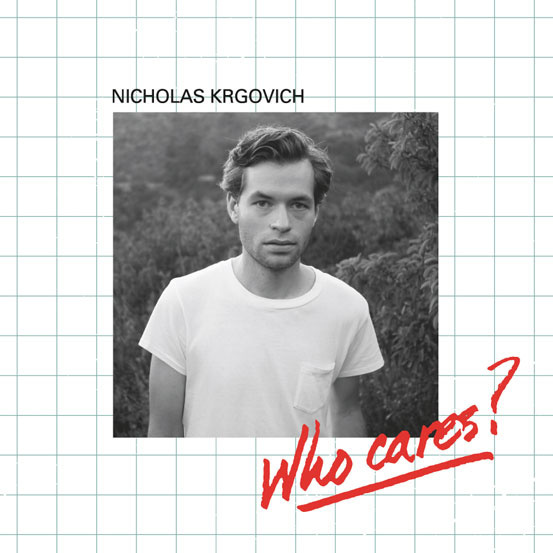 This is the first release in years from songwriter/multi-instrumentalist Nicholas Krgovich and it is a strange one. When we last checked Krgovich was slinking around the floor to the icy, r'n'b inflected sophisti-pop of NO KIDS, or masterminding the Phil Spector indebted girl group sing-a-long's of GIGI, or manning the keyboards and touring the world with MOUNT EERIE and NITE JEWEL. There's also been the absence of a long finished, four-years-in-the-making magnum opus, a widescreen paean to Los Angeles, written before he was living there in a small house in South Pasadena. There's also the music composed for hair commercials starring Beyoncé's sister. So what do we have here? WHO CARES? is a small, short record. Perhaps even a personal one. It's a collection of truly bummed out and lonely-sounding songs, but they're fashioned in such a quiet, composed and lovely way that they paradoxically end up being quite hopeful and tender. Laughter-through-the-tears in album form. Singing in a low, warm tenor and playing a guitar for the first time in ages, Krgovich presents a series of songs that are so spare and direct, they play out less like songs and more like little life events. Which is in keeping with how this work came about, earlier this year while Krgovich was mansion-sitting for his aunt. In the middle of a cold, foggy winter up in the mountains, alone in a grand house where doors would slam and closets would creak open on their own, after returning from an extended stay in southern California where things were sunnier in almost every way, the songs ended up appearing out of nowhere. The only leading idea was to try approximate Frank Sinatra's sad sack masterpiece "Only The Lonely" sans the golden voice, and implying Nelson Riddle's orchestrations as opposed to actually hearing them. What we end up with is a beautifully intimate and clear recording of songs that intertwine Sondheim lyricism, doo wop melodic turns, and barely-there instrumentation which creates its own inviting and idiosyncratic world that leaves much to turn over and explore. And how about the album title? WHO CARES? It's such an insane phrase, inherently carrying contractions and dual meanings. On one hand it's flippant, and the conversation ends, and on the other, it's clear-eyed and imploring. Be sure everything's going on here.